Join the discussion on our forums! Come discuss Wrathion over in our dedicated Wrathion discussion topic. Taunt. Battlecry: Draw cards until you draw one that isn't a Dragon. Wrathion, son of Deathwing, is a dragon. Why isn't he tagged as a dragon, you ask? WHAT, ARE YOU TRYING TO BLOW HIS COVER?? Such a cool character and such a lame effect. Basically helps the most times for only Priest because Priest has most sinergy with the dragon cards and Northshire cleric and draw utility cards. Why isn't he a dragon? huh...his title is The Black Prince as he is the grandson of Deathwing, and thus he is also a dragon. Deathwing is his father nor grandfather. Either way it still stands that he is a dragon, regardless of the form he's in. Hopefully they change it now that they are revisiting the tribal tags. Great card to discover from Stonehill Defender when playing dragon priest - I included stonehill purely to pull him and Obsidian Statue. Awesome draw and survivability when I can discover it! is this card in dragon decks, anymore? I mean, i have not seen a single dragon priest, let alone this card, at all in these early stages of KFT. 1 more mana for +1hp and taunt. Not spell power but the chance to draw more cards. Where did you learn the worth of stats in hearthstone, I have been looking around to research and deck build but I haven't so far. 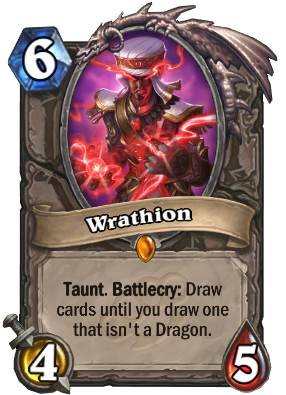 I want to say Wrathion will gain in value when the next expansion comes in and Twilight Guardian gets put to pasture, but then again, he is two mana more in costs, has one less hitpoint, you can only carry one instead of two, and who knows how effective his draw mechanic is with Blizzard having to replace quite a few dragons. He probably will be useful in Wild dragon decks though. guys should i craft this?